A screenshot of a Word 2003 document in a screenshot of a Word 2007 document in some dynamically generated HTML. Cool. Last fall, as I’ve said before, I had the opportunity to teach Technical Writing to a bunch of Computer Science students. It was what we called a “hybrid online course” — a Tuesday/Thursday class, but we only met in the classroom on Tuesdays. Then on Thursdays they would visit the class’s website, get the week’s assignment, and get a tutorial I’d written teaching them how to do the assignment. We’d originally set the class up that way as a convenience for me (so I didn’t have to take off from work two afternoons a week). The Thursday tutorial became one of the most challenging parts of teaching the course, though. I’d spend the whole weekend prepping for my Tuesday lecture, spend Tuesday night decompressing and then all day Wednesday at work, and by the time I had a moment’s free time, I was already pushing it to get the document done in time for my 1:00 deadline the following day. Way too often I spent my lunch break Thursday sitting at my desk at work, frantically finishing up a document to upload before the scheduled class period. That got to me. You already know I’m a fan of getting it done early, and every Thursday I was hitting “Publish” knowing there was something I’d missed, something I could have said better. No one said a word. After a moment I clarified the question. “Did it make sense?” Lots of nods, which weren’t too helpful. “What was missing? What did you still need to know?” Nothing. When you write as much as I do, you get used to working with a lot of different tools (and you quickly learn how to make do with all of them). I’m not going to spend a lot of time teaching you how to use any one particular kind of software, because there’s plenty of words out there on that already, and whichever one I decided to teach you, I’d be alienating a big chunk of my audience. Instead, I’m going to make sure you do know what’s out there, and I’m going to help you pick the right one for your purpose. 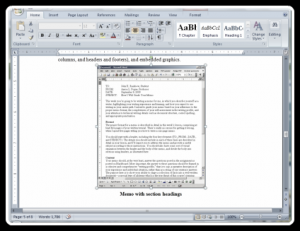 Word processors these days are packed with hundreds of features that even professional writers don’t ever touch. The real trick is to figure out exactly what set of resources you need, and pick a program that can do those things well. Everything else is just glitter. For what it’s worth, I wasn’t using Word ’98. The screenshots were from Word 2003. Admittedly, that’s still a seven-year-old piece of software that’s at least four revisions out-of-date. It’s the mandate where I work, though — for all I know, it might well be Federal law. It doesn’t matter a lot. I wrote my second novel (and all my many college papers) in Word ’98, so I know its features front-to-back. I used 2002 and 2003 at my first job (and, yeah, 2003 at my current job). I use 2007 at home. That’s hardly all, though. I also use Open Office from time to time (a free open-source clone that does a pretty good job emulating the older versions of Word). It feels a little unpolished, compared to the Microsoft product, but it’s an awful lot cheaper. It also features some powerful automation tools that are a lot nicer to work with than Microsoft’s Visual Basic for Applications, but you’re not going to care about that unless you’re a programmers. Sometimes all the features in those big fancy word processors just end up getting in the way. In fact, once you’re doing advanced work, it actually happens more often than you might think. I make liberal use of Notepad (Microsoft’s bundled text editor), but my go-to guy for pure text manipulation is EditPad Pro by JGSoft. It’s amazingly useful. That’s not the end of the list, either. In fact, it’s still missing the biggest player (by volume, anyway). For the last year or two, I spend more time writing and editing online than I do in any installed word processor or text editor. Obviously you know I work in WordPress, which is a fantastic editing interface for blog posts, but all my serious writing happens in Google Docs. Do you know Google Docs? If not, come back next week. And the week after. And probably the week after that. I’m going to do a whole series on Google Docs. That’s how much I love the product. Are You Designing for Paper? When you’re deciding which software to use for any given project, the first question you’ve got to ask yourself is, “Am I designing for paper?” Is your stuff going to be printed, or will it be forever digital? If it is going to be printed, how good does it need to look? Traditional feature-packed word processors exist to make words look good on paper. If that’s something you need, then they’re fabulous. If it’s not, then a lot of their tricks and shortcuts and assumptions can easily get in the way of your writing. Technical Writers still need to design pages, most places. So do aspiring novelists, who need to be able to prepare immaculate submission packages to send off to super-critical agents. If you’re happy with 50,000 words of body text paragraphs, interrupted by the occasional centered chapter heading, that you can get away with in any software you choose. But if you want to be able to design a neighborhood association flyer that you can print off in your office and fold in your living room, you’re looking for some pretty advanced page formatting. Of course, there’s times when your answer can change even over the course of a single project. You might find yourself writing drafts in Google Docs (or just the WordPress Dashboard), but then when you’re ready to print them off you’ll transition them into an honest-to-goodness word processor. Now, whether you should use Microsoft Word or Open Office or Pages, that’s a separate matter. The feature set is pretty similar, but the rightness of any given program depends on your personal taste, familiarity, price, and platform. You should choose one, though, and learn how to use it. Do You Work at More than One Computer? Still, for the vast majority of writers these days, a purely digital format will do the job. That’s what you’re looking at in WordPress, for instance, which certainly lets you change font and character format, but repositions your column width all willy-nilly and never once suggests a page break. There’s more to it than that, though. I already admitted above that I do a ton of work in Google Docs (which is exactly the sort of “50,000 words of body text paragraphs, interrupted by occasional chapter headings” software I was talking about). In fact, I described precisely my method at the end of the last section — I write everything in Google Docs (or, more and more, Google Wave). That’s because I work on half a dozen different machines, each with its own My Documents folder, its own software configuration, and its own rules concerning what sort of files I can work with. Keeping a document saved to a format that can work seamlessly among all those different types of software can be a hassle. Even worse is trying to keep up with the most recent version of a document, as it bounces back and forth among them all. Most of the digital-only editing tools out there are “cloud services” — which is to say that they are storing every document on a remote server (redundantly backed up and deeply protected against accidental loss or corruption). That means whenever I want to tack a couple more pages onto my work-in-progress, I can just pop over to Google Docs, open it up (from any computer that has internet access), and I’m automatically working on the most recent version of that document. Any changes I make are saved to the cloud, so if I opened the same document an hour later at a different location, on a different computer, it would be fully updated and ready to go. That’s a huge feature for most writers. It’s not the end of the conversation, though. There’s a whole lot more still to be said, but I’m well out of words for today’s post. If you’re at all interested, come back next week for my checklist of absolute feature requirements for good writing software, and a couple recommendations for specific programs in specific situations. This was written by Aaron Pogue. Posted on Tuesday, April 13, 2010, at 6:50 am. Filed under For Work. Tagged Technical Writing, Tips and Tricks, Writing Software. Bookmark the permalink. Follow comments here with the RSS feed. Both comments and trackbacks are currently closed. Yay Google Docs!!! And Picnik.com has become my new best photo friend. I heart it mightily. Thanks, Courtney. Carlos really liked it, too. I’m a little worried I’ll be preaching to the choir with my Google Docs series, but it seems like information that would be worth having up on the site (to point people back to in the future). I guess if it’s not super useful for my regular readers right now, they can just look at it as a three-week break from having to read my Tuesday articles! Of course, if they do that, they’ll miss out on all my funny little stories. That would be a shame. The choir can always use a tidbit more info here and there. And they wouldn’t be the lovely, smashingly intelligent choir that they are, if they didn’t get to hear your stories. P.S. Yay comment nesting! I love it. I started using google docs about 4 years ago when I couldn’t get to a word proccessor or spreadsheet. it was ok at that time but it is much better now. I haven’t made the jump to that yet. I have used OpenOffice as well, when I was taking my daughter to dialysis, they had computers up there to use (before my laptop) and I had OpenOffice on a thumbdrive with PortableApps. Worked great to write and do things that could be imported to office on my home computer later. Right now, I am writing stories on yWriter. It is cool because you can write scenes as independent blocks and then arrange or otherwise play with them later. I like it because I can write 2 sentences that a character will say in book number two and have that waiting for me if I ever finish book number one. Ooh, I’m glad you left that comment, Justin. You reminded me of a couple things I’ve been needing to take care of, all at once. For a while now I’ve been hearing about special writing software like that tailored to storytellers. I keep meaning to check one out, but I never have. I’m glad to hear you’ve had good experiences with that one. Google Docs works really well for me, but only after I wrote a Python program to harvest a document from the cloud service and then insert it piecemeal into a custom MS Word template that I designed. Not exactly an easy solution, and when I tried to adapt it so Courtney could use it, I couldn’t even get close (she uses a Mac). Big news just came out this week about some major revisions coming to Google Docs, though. I doubt that will change anything I’ve said here (or anything I’m saying next week), but it should still make Google Docs more powerful than it has been, and that’s definitely a good thing.